Had a customer come in today with a ‘dead’ iphone. He had already gone in to Apple, and they diagnosed it as a dead motherboard, quoting him £120 (they wanted to replace the phone for a refurb). What about his data? Pictures? Music? Calendar? Messages? He was told there was no chance of getting his data back unless he had a backup (erm… backup? what backup? hint to customers: BACK UP YOUR DATA). Understandably, the customer was devastated, but remembered we did repairs and came to us asking for some magic. We tested out the phone, and discovered his motherboard (and onboard memory) was working a-ok, and that the problem was actually with his battery. 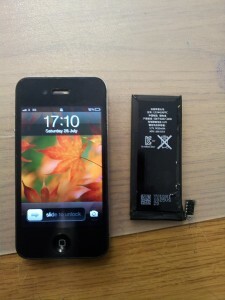 A few minutes later, and a new battery, and his iphone was magically brought back to life.